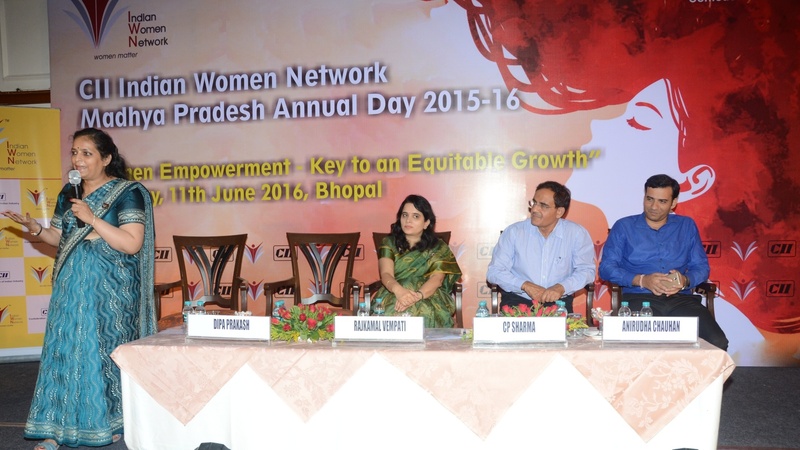 CII Indian Women Network (IWN) marked its Annual Day celebration with zest at Jehan Numa Palace, Bhopal on 11 June 2016. The programme was based on the theme 'Women Empowerment: Key to an equitable growth'. Women, today, play a key role in every sector; be it in entrepreneurship or on the professional front and contribute unprecedentedly towards the development of the nation. CII created the Indian Women Network as an exclusive platform to encourage women entrepreneurs and empower them to encourage meaningful involvement in social and professional environments. IWN was launched in 2013 as an organisation exclusively for career women. It enables women to become better professionals and achievers in their respective fields through learning, sharing and mentoring. Currently, IWN is actively engaging with members in 12 states and 7 zones nationally with a membership of over 1,700. Through its unique initiatives, IWN aims to bring women from all spheres to discuss issues, opportunities and learn from each other’s experiences. The programme began with the lighting of the lamp and an inaugural address by Ms Dipa Prakash, Chairperson, IWN, Madhya Pradesh, and Director – Operations, Omega Renk Bearings Pvt Ltd. She spoke at length about IWN and its initiatives. She said that women play a pivotal role in our society and to strike a balance in the modern society and to take India forward, they should be empowered and enabled. This was followed by an address by Mr CP Sharma, Chairman, CII, Madhya Pradesh State Council. Ms Rajkamal Vempati, Chairperson, IWN, CII Western Region & Executive Vice President and Head - Human Resources Axis Bank introduced IWN and also played a video on IWN. The programme featured a panel discussion on ‘How to get from where you are now to where you want to be’. Eminent panelists like Ms Archana Sharma, Thought Technologist, Ms Roccia Bliss, Ms Rajkamal Vempati, Chairperson, IWN, CII - Western Region, Ms Neha Thakur, Founder, Rising Litera, Smt Archana Chitnis, Member, Madhya Pradesh Legislative Assembly and Dr Manisha Sharma, Coordinator-Vocational Cell, IEHE shared their experience and spoke on ways to succeed in business and life in general. The discussion was moderated by Ms Sravani Sarkar, Editor-In-Chief, Newsbits. Ms Sarkar spoke about the opportunities of women in the media industry and the challenges has to face. The programme concluded with a mesmerizing Bharatnatyam recital by Bharti Hombal from Kalapadam Bharatnatyam Dance Academy.